Now that there are many form of social media and online stores all over the Internet, we can sometimes find it difficult to sign in to each of them due to forgotten password. The best thing to do first is to check all your details if they are updated such as your email address that you used or your phone number linked to that social media account. You can still login to your account just in case you forgot your password by simply requesting for a temporary login code or you can request for a password reset. All you have to do is provide the email address or your verified phone number for that account so that they can send you the link or code to reset your password. 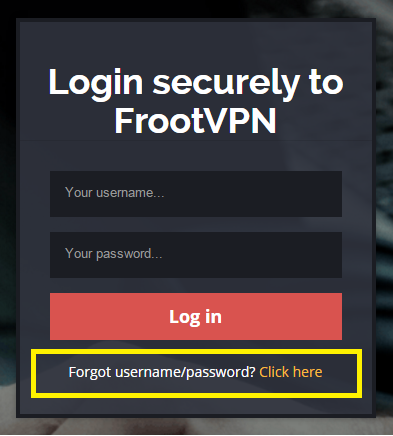 Here at FrootVPN, you only need your valid email address to recover your login password for your account. The first thing to do is go to the login page and if you’re a hundred percent sure that you don’t remember your password, you can see something like this “Forgot password? Click here”. 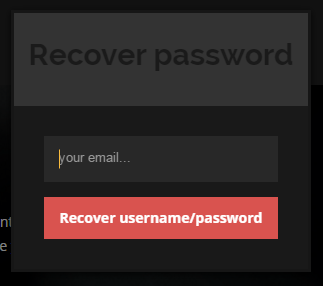 You can click on it and there will be a pop up message with “RECOVER PASSWORD” details that will look exactly like this. Type your email address associated on this account then click that red button with Recover username/password written on it. Once you’re done, another pop up message will go like this one below. The next step is you can now check on your email if you already received the password reset link. Once you seen it, click on that link. You can now type your new password then you have to do it again just to confirm. Click on the Reset Password button and you’re done. That’s it! You can now sign in using that newest password that you’ve created.